Hydroponics is the science of growing medical marijuana without soil, most often in a soilless mix. Most growers today prefer hydroponics as it produces larger buds in a faster time. With hydroponics, nutrient uptake and grow medium oxygen content can be controlled easily. 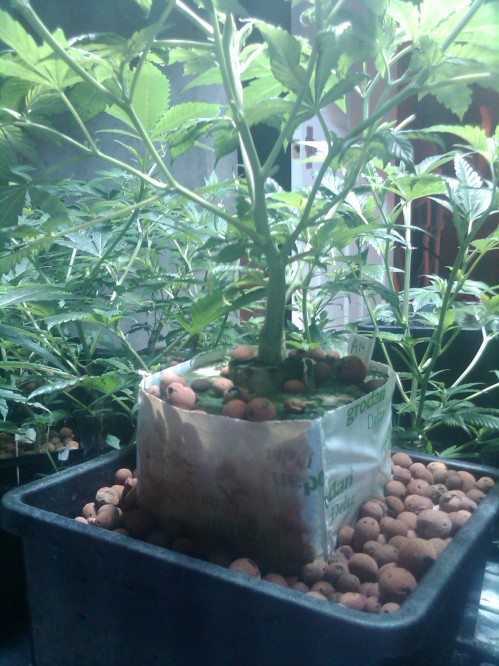 Cultivating clones in rockwool, coconut fiber or peat moss is considered growing hydroponically. Growing mature or mother plants in soilless Sunshine mix or Terra-Lite, even when watered by hand, is hydroponic gardening. The inert soilless hydroponic medium contains no nutrients. All the nutrients are supplied via the nutrient solution-fertilizer diluted in water. This solution passes over or floods around roots at regular intervals, later draining off. The extra oxygen trapped in the soilless medium and around the roots speeds nutrient uptake by tiny root hairs. Medical Cannabis grows very fast hydroponically, because it is able to take in food as fast as it can be used. In soil, as in hydroponics, the roots absorb nutrients and water. Not even the best soil will have as much oxygen in it as a soilless hydroponic medium. When it comes to growing medical marijuana hydroponically, there are 2 different ways to do this. The first distinction is whether the nutrient solution is applied in an “active” or “passive” manner. Passive systems rely on capillary action to transfer the nutrient solution from the reservoir to the growing medium. Nutrient solution is passively absorbed by a wick or growing medium and transported to the roots. Some of the most common absorbent growing mediums are peat moss, sawdust and vermiculite. Active hydroponic systems “actively” move the nutrient solution. The most common active systems are flood and drain, as well as top feed systems. 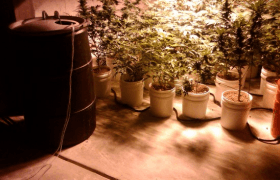 Marijuana plants are fast growing and are very well suited for active hydroponics systems. Growing Medical Marijuana using DWC or Deep Water Culture is simple, easy and productive. Outdoor Growers using DWC add a drainage hole in the side of the reservoir to prevent rainwater from overflowing. The roots from your clones or seedlings dangle down into the nutrient solution to the top of a discharge tube where it splashes into the access lid. Nutrient solution cascades down, wetting roots and splashing into the self-contained reservoir below, which in turn increases dissolved oxygen in the solution. 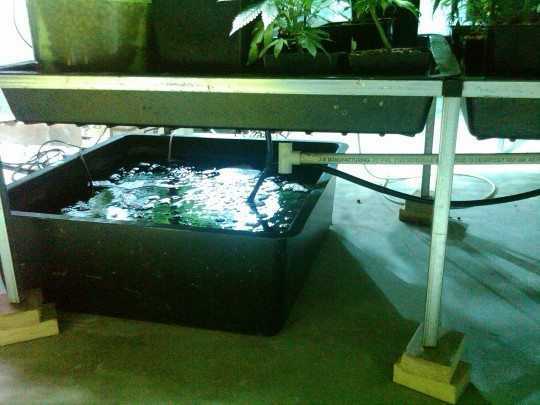 Deep Water Culture Grow Systems are simple to use and they do not require any timers as the pumps are on 24 hours a day. Air Table Grow Systems are also very simple and easy to use. The nutrient solution is forced up to the growing bed with air pressure generated by an external air pump. Self-contained top-feed buckets consist of a growing container nested inside a reservoir containing a pump. Single buckets make pulling out and replacing a injured or sick plant easy and quick. Top-Feed systems are great for growing mother plants as you can see in the picture above. Top-Feed Slabs are very popular with warehouse growers when growing marijuana. I use top-feed grow systems in my warehouse in Denver, Co.. Rockwool or coco slabs thats are covered in plastic serve as the actual growing container. The nutrients are delivered via small water tubing from the top of the slab. A drip head attached to the end of the tubing is held in place with a drip spike, thus allowing a steady slow drip on a 24 hour cycle. Using a table with a drain and rockwool or coco slabs, you can grow marijuana using Table of Slabs method. Just like Top-feed Slabs, table of slabs uses small water lines to deliver the nutrient solution to the top of the slabs and drain out the bottom back into the nutrient reservoir. 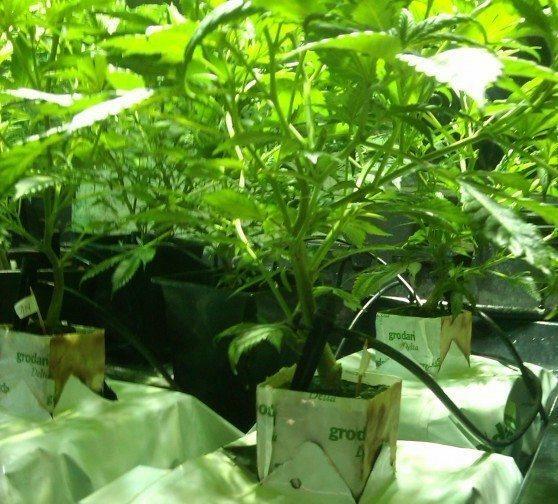 The benefit of using Individual Rockwool Blocks to grow plants is that they can be moved around with ease since they are not connected to each other. As with all top-feed systems, individual cubes use water lines to feed the plants on a drip system. Vertical growing systems used for marijuana gardens can increase overall yield and more than 10x over a regular or ebb and flow garden. Substrate bags, tubes, or slabs are positioned vertically around an HID Light. Growing Hydroponic marijuana using Nutrient Film Technique (NFT) is one of the least common ways of growing. They are known to be high-performance gardens when set up and used properly. The roots from the plants grown in an NFT system are located in gullies. Nutrients are aerated and sent to the gullies to feed the plants. Aeroponic growing requires no growing medium and offers the highest performance possible. Roots are suspended in a dark grow chamber without any medium where they are misted with oxygen-rich nutrient solution at regular intervals. The humidity must be kept perfect in aeroponic growing systems, which helps the roots absorb maximum amounts of nutrients.